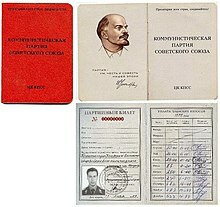 Communist Party of the Soviet Union membership card, 1989. The cover is a typical red color, and Vladimir Lenin is displayed on the inside cover. "Card-carrying communist" is a term popularised during the Second Red Scare as a label for members of communist and far-left organisations, especially the Communist Party. The term is still considered derogatory when used in its Cold War context. Senator Joseph McCarthy alleged that the United States Department of State had been infiltrated by "card-carrying communists." The term "card-carrying" originally had no political connotation, and was used to describe membership in any organisation. During the Second Red Scare, the term was used as a label for members of the Communist Party, and was used in this manner by both the House Un-American Activities Committee investigations and Senator Joseph McCarthy. In the context of politics, the term remains derogatory. After the 1950s, the scope of the word expanded and is used for non-political applications. Senator Joseph McCarthy claimed there were fifty-seven "card-carrying communists" working for the United States Department of State, an allegation that was widely reported by American newspapers. This figure was different from the 205 "bad risks" figure, confusing reporters. The "fifty-seven card-carrying Communists" phrase first appears in a radio interview that McCarthy gave in Salt Lake City, and is the phrase that appears in the Congressional Record on the speech he gave at Wheeling. McCarthy made a distinction between "card-carrying communists" and what he called "fellow travelers." A card-carrying communist was considered a genuine member of the party, while a fellow traveler only sympathised with the ideology. 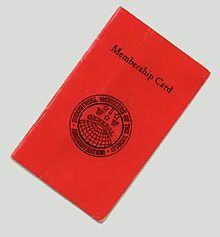 A membership card of the Industrial Workers of the World, a left-wing internationalist union. Early in the Cold War, there were Communist Party members who kept membership cards, although many also hid their membership. Possibly the earliest mention of the phrase comes from a 1912 article in the Daily People, which mentioned "'Union-card' carrying members". A closer reference to the modern term was a 1918 piece in the New York Tribune, which described members of the Industrial Workers of the World, a prominent socialist union, as "red-card-carrying 'wobblies'". Because of the advent of digital technology, the contemporary Communist Party USA does not issue membership cards. Many Protestant and Catholic Christians, as well as political conservatives, worked together to popularize wallet-sized or pocket images of The Head of Christ by Warner Sallman, promoting the idea that "there ought to be 'card-carrying Christians' to counter the effect of 'card-carrying communists'." Up until the collapse of the Soviet Union in the 1990s, the Head of Christ "had been printed more than 500 million times and had achieved global iconic status." ^ a b c William Safire (9 November 2011). "Drop that Card". Quoth the Maven: More on Language from William Safire. Random House Digital, Inc. ISBN 978-0-307-79974-6. Retrieved 3 October 2012. ^ Rosemarie Ostler (6 September 2011). "Card-Carrying Commies, Commiesymps, and Reds Under the Bed". Slinging Mud: Rude Nicknames, Scurrilous Slogans, and Insulting Slang from Two Centuries of American Politics. Penguin. ISBN 978-1-101-54413-6. Retrieved 3 October 2012. ^ a b c d e f Wickman, Forrest (2 October 2012). "Do Card-Carrying Communists Really Carry Cards?". Slate. Retrieved 3 October 2012. ^ Richard H. Rovere (12 April 1996). Senator Joe McCarthy. University of California Press. pp. 128–129. ISBN 978-0-520-20472-0. Retrieved 3 October 2012. ^ Robert Griffith (1987). The Politics of Fear: Joseph R. McCarthy and the Senate. Univ of Massachusetts Press. pp. 53–54. ISBN 978-0-87023-555-9. Retrieved 3 October 2012. ^ Edwin R. Bayley (22 October 1981). Joe McCarthy and the Press. Univ of Wisconsin Press. pp. 20–21. ISBN 978-0-299-08624-4. Retrieved 3 October 2012. ^ Prothero, Stephen (15 December 2003). American Jesus: How the Son of God Became a National Icon. Farrar, Straus and Giroux. p. 117. ISBN 9780374178901. During the postwar revival of the 1940s and 1950s, as Protestants and Catholics downplayed denominational differences in order to present a united front against the menace of godless Communism, Sallman's Jesus became far and away the most common image of Jesus in American homes, churches, and workplaces. Thanks to Sallman (and the savvy marketing of his distributors), Jesus became instantly recognizable by Americans of all races and religions. ^ Morgan, David (1 July 2006). "The Face That's Everywhere". Christian History. Christianity Today. Retrieved 1 May 2014. The World War II context was equally important for the dissemination and popular reception of Sallman's chief image, "The Head of Christ." The Salvation Army and the YMCA, both members of the USO, handed out pocket-sized versions of the picture to American soldiers leaving for Europe and Asia. Millions of copies found their way around the world and became a fondly remembered part of the war experience for many veterans. After the war, groups in Oklahoma and Indiana conducted broad campaigns to distribute the picture across private and public spheres. A Lutheran organizer of the effort in Indiana said that there ought to be "card-carrying Christians" to counter the effect of "card-carrying Communists." Copies of Sallman's "Head of Christ" were placed in public libraries, schools, police departments, community centers, and even in courtrooms. One photograph from 1962 shows Vice President Lyndon Johnson posing reverently beside a copy of the picture sent to him in Washington. ^ Morgan, David (1996). The Art of Warner Sallman. Yale University Press. p. 192. ISBN 9780300063424. The message in all such accounts was that Christ, visualized by Sallman, was the key to overcoming otherness. Jesus was everyone's friend and Lord, at work throughout the world, ultimately recognized by all. This was an important message in the context of international contention following World War II. The pocket version of the Head of Christ served as the principal icon in the conservative political propaganda from evangelical quarters. Carl H. Duing, an Indiana businessman, pitted what he called card-carrying Christians against "card-carrying Communists." ^ Blum, Edward J.; Harvey, Paul (21 September 2012). Color of Christ. UNC Press Books. p. 211. ISBN 9780807837375. Retrieved 30 April 2014. The Cold War united Protestants and Catholics as comrades against atheistic Communism, and the children of immigrants who had once been deemed nonwhite were not becoming emblems of America and its faith. The election of John F. Kennedy in 1960, who convinced voters that his American identity, not his Catholicism, would shape his political decisions, was another watershed moment of that religious rapprochement. By the 1990s, Sallman's Head of Christ had been printed more than 500 million times and had achieved global iconic status. This page was last edited on 5 April 2018, at 20:01 (UTC).